AI War Beta 6.010 "Back From The Valley" Released! This one is our first update to AI War in three months. For us, that’s a really, really long time between updates. There’s a variety of reasons for the lull, but the most significant one was our need to focus on getting A Valley Without Wind 2 done and officially released. Now that that’s done and we’ve had a few days to catch our breath we’re trying to get things going again on this side of the shop. We still have other projects underway so it’s not going to be full-steam-ahead or anything like that, but we can keep iterating to make the game better at killing players more fun. The update itself addresses some of the more pressing issues (according to the last couple of months’ feedback), specifically: making the recently-returned friendly enclaves less lag-prone and less overpowered, toning down the Ancient Shadows “brutal pick” posts, fixing a loophole where special forces were sometimes getting low-cap-ships without really paying for them, and making the AI’s strategic reserves less annoying during assaults on AI homeworlds. Valley 2 Official 1.001-1002 "Mouse Aiming For Those Who Stood And Fought" Released! More newsworthy, undoubtedly, is the addition of a new option in the settings menu that enables mouse-aiming. This is something I said I'd never do for this game, but apparently never say never. However, there are some people who simply can't play the game without mouse controls, apparently. I say that with only mild bitterness, heh. In all seriousness, there are people who simply have not learned that method of controlling games. It's the longer-standing method of controlling games, but that's really irrelevant. I remember how I felt when I was first exposed to dual-stick FPS controls on consoles -- I thought it was the most terrible thing ever. Now I think it's fine, but again that's beside the point. I also remember how hard I found the transition from being a keyboard-only FPS player to a mouse+keyboard FPS player (yes, I'm old), but once I did make that transition I never looked back -- WASD plus mouse is incredibly superior for FPS games. The point is, there are apparently a sizeable group of people who feel the same way when it comes to sidescrollers. I still disagree, and I encourage those people at least to give the gamepad or keyboard controls a shot. However, I remember how I basically found dual-stick shooters unplayable at first, and if that's how the keyboard/gamepad controls made you feel about Valley 2, then there's now a salve, at least. Anyhow, long story short, not for the first time I'm forced to eat my words. Never say never and all that. I'm sure it won't be the last time either. For those people who were put off by the lack of mouse controls, hopefully now you'll find the game to be actually something you can play. Valley 2 combines an old school platform adventure with a robust turn-based strategy portion. Though the game is a sequel to our 2012 release A Valley Without Wind, it's more of a spiritual successor. We took everything that we learned while making the first game (plus many new ideas) and focused it all into a new, tightened experience -- giving the graphics an update to boot. For a variety of reasons, we've also chosen to give Valley 2 to all those who purchased the first game for free, and those purchasing Valley 2 will also get a copy of the original. The titles are, and will remain, bundled together on Steam and elsewhere. 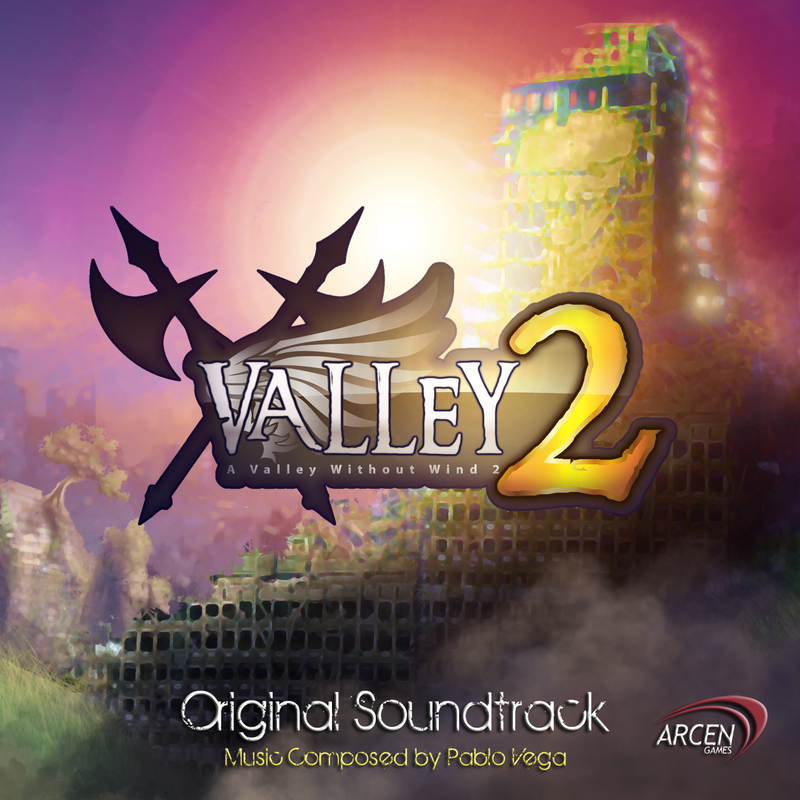 The official Valley 2 launch trailer, featuring the game's standout track "Stand and Fight" by composer Pablo Vega, is out now as well. For more info and discussion on the A Valley Without Wind 2, we encourage new players and other interested parties to stop by the game's bustling forums. AI War's third and largest expansion Light of the Spire marked Arcen's first release of 2011, with the rest of the company's focus being devoted to their most massive project yet: A Valley Without Wind, which released in 2012. The end of 2012 has been another busy time for the team, with AI War's fourth expansion Ancient Shadows launching, A Valley Without Wind 2 reaching beta, and their recently announced top-down survival game Shattered Haven scheduled for release in the coming months. This one brings us finally to the release build of the game! Included in this are some camera improvements, 50 new achievements, and the end-of-game cutscenes. I'm running a bit behind on actually getting our trailer up on youtube, getting our local store page updated, new installers online, and so forth, but that will happen later today. Also later today I'll do a 1.001 release that will include the proper list of players who made contributions during the beta period (like we have for the alpha). But in the meantime, the game is now fully out on Steam, and 25% off to boot! This one is probably the last release before 1.0; we'll see. Tomorrow is the big day, and aside from last-minute nice-to-haves and the cutscene at the end of the game, everything is now done and in place! On Josh's end, he's completed all of the slice fixes based on things that were found to be wrong with them via our automated unit tester. There were over 1300 issues in all which the unit tester found, and all of those are finally fixed -- it was a truly grueling process for him, but the result is a much more polished game. Beyond that, it's bugfixes and artwork tweaks and so forth. This one continues the final polish. There's a bunch of updated art, more updated writing, and a variety of mostly-minor balance improvements. Also a handful of bugfixes. The biggest thing in this release is the three new playable characters: Hinge, Kyo, and Farel. Farel is definitely one of my favorites now! This brings us up to our full roster of 12 playable characters, with some color variations for several of them in addition to that. Oh, and also, there's now a handy way to view your currently-equipped perks from the escape menu. I can't believe we didn't think of this, and I'm not aware of anyone mentioning it to us before (or at least it didn't pass my desk). But a member of the press mentioned that today, and it seemed like a boneheaded omission. There was another thing like that in there, too: Cinth pointed out how we never labeled any of the spells as to which were primary, secondary, special, or ammo. Yet perks reference those specific categories by name. Facepalm. Again that was not something I'd ever heard anyone say anything about until today, and it didn't occur to me, but actually two people (one again a member of the press) brought it up within 12 hours of each other today. Go figure! On the bright side, as frustrating as it is for me to have missed stuff that seems so basic as that, it really doesn't seem like there's a lot of that sort of thing. My fingers are crossed that I haven't been blind to something else that's going to make me smack my head, though, heh. Tomorrow the last of the monster sound effects are coming, as well as the last of the writing (including the end of the game scene). And then the day after tomorrow is 1.0 release day! This one is the second release today. As indicated by the increment in release number to 0.900, we're now very near to final 1.0 on the game. This release has a lot of relatively minor fixes and changes, which is pretty much what to expect from here until 1.0. That, plus the remaining sound effects, the last of the art, and the last of the writing. There's a good chunk of writing and art in this one, and the entire tone of the boss fights in particular is completely different now; you get more of a sense of the backstory of the individual characters you're facing. We had a lot of cool backstory for this game, but it wasn't really utilized until lately. We've been working on the region interjections when you go into a new region, too. Valley 2 Beta .809 "Concentrating On Calibers" Released! This one is the first of what will be two releases for today. It basically does a lot of tuning to the concentration and caliber systems that were revised in the prior release, and fixes a few other bugs (such as charge shots not charging at all in the prior version). There are some other cool spell changes in here as well, such as to bombs/mines timing, blast distance/power. Also swamp belltowers now work properly on the world map for the first time! Valley 2 Beta .808 "The Sound Of Violence" Released! 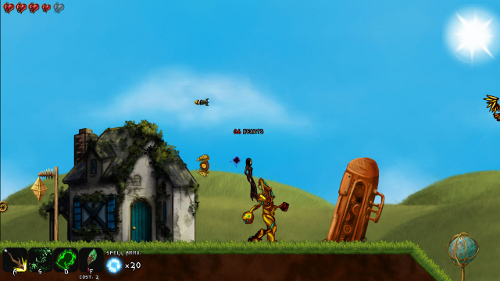 This one has a bunch of stuff, like more monster graphics finalizations and a number of bugfixes. It also has some pretty major balance change. Knockback was sort of an interesting mechanic the way we had it in the first game, but it's really been overshadowed by other mechanics in the second game. A lot of player spells used to have knockback, but so many monsters had knockback resistance that it was basically pointless. Now there are many fewer spells with knockback, but they are way more effective with it because monsters now rarely have much resistance to it. All in all this makes the mechanic something that is spell-specific but a lot more interesting than it has been so far in Valley 2. Urgh... this one is hard to explain in any depth. The release notes have all the hoary depth. But the short of it is that spell calibers are now simpler to understand and use: they have ratings of Low, Normal, High, and Ultimate. Most player spells are Low. Most monster spells are Normal. There are exceptions mainly on the player side, noted clearly in spell descriptions. A higher spell beats a lower spell when they collide, and spells of equal rating both die when they hit one another. Where it gets a little crazier is when you start using the perks that give caliber boosts, or the caliber boosts from concentration bars. These things increase you partway toward the next rating, essentially, but not all the way. You can therefore use several of your buffed lower-caliber-rating shots to take out a single higher-caliber-rating shot of an enemy in that circumstance. That's really the overview, and unless you love numbers you don't need the details. For those who love numbers, of course all the details are in the release notes. The basic reasoning behind these changes were basically threefold: 1) to make the mechanic clearer in general; 2) to prevent an exploit that some players had discovered in the last little while; and 3) to otherwise change as little as possible, because calibers are really cool and were largely working well. - The henchman fights are basically unchanged for the most part, EXCEPT that the player now has some advantages that they didn't before. Your ammo based shots can actually block the henchman shots, unlike before. - The overlord is about the same as he was before. - Some of the monsters with smaller shots that were incredibly cheese-able (like the Auroch Warriors) are now fixed to work like other monsters that you'd expect. In other words, the bad edge cases where monsters were too wimpy have been fixed. - Things like explosive crescent now work more reliably against all regular enemy shots, with a very few exceptions rather than a lot of exceptions. Things like whips now work against enemy spells like the crescents do, whereas previously they did not (making whips more awesome now). 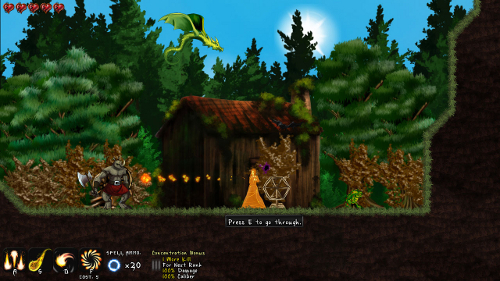 - Regular straight-shot spells, ricochet spells, and so forth now reliably do NOT work against enemy shots. That was largely already the case anyhow, but there were funky edge cases where that didn't hold true and felt odd. The release notes spell this out in detail, but areas now reset when you leave them, and are back to a more starting state as soon as you re-enter them (you don't have to wait 10 seconds, as in Valley 1 or earlier builds of this game). It feels a lot smoother this way. I've been wondering what Misery was complaining about, because he's a really good player and I could do these hacking escapes without too much trouble. Granted, I was playing on Adept and he on Hero, and normally I'd play on Skilled or Hero for a true challenge... but it should all scale up, right? Apparently wrong. On the harder difficulties, these things got exponentially harder. They were on the longish side anyhow (understatement of the year), and had some enemies spawning that are truly annoying when you're trying to rush and don't have time to take things more tactically. I've changed things around so that they are still incredibly tense and you still feel on the edge of losing, but it's not such a foregone conclusion. I've come within about 1 screen of winning on Hero difficulty at this point, and I'm pretty sure I could do it given another go or even just some basic equipment. In other words, it might not be perfectly tuned yet, or I might just not be quite good enough for Hero difficulty. But either way it's in the ballpark of correct. One thing I want to stress about the robotic hacking escapes is that yes, they are definitely supposed to throw the tactics of the game out the window. Normally you play with tactics, but here it's more about throwing all that to the wind and trying to frantically escape while robots swarm you. Stopping to handle things tactically is a bad idea here. The changes I've made in this version make the monsters weak enough so that this is actually feasible -- you'll take damage constantly through this escape, but it's less damage than usual, sneakily. It's something to make you feel like you're being brutalized without really doing so. I got that idea from a Gamasutra article that I can't find to link to, that I read a year or two ago. I think it was about the boss fights in God of War or something of that nature, where basically you need to have a moderate challenge but feel absolutely on the edge of death just because of psychological cues. That's going on here to make these sequences seem impossible when they're really just hard. In prior versions, the problem was that it was actually impossible on the upper difficulties. Now I just have the monster sound effects left to go, and then that will be it for the sound effects work! Valley 2 Beta .807 "Melee Deux" Released! This one is another smorgasbord-type release, with tons of things in all sorts of varying areas. There's updated monster art, yet more nice-to-have style improvements to the strategic game interface, more sound effects work, more balance fine-tuning, and some new cheats. Oh, also a new character and a new keybind for the world map movement of NPCs without opening the menu. The really big changes in this one are all about melee, and the resistant-to-all-but-melee monsters. Basically the touch, punch, and fist spells have all been completely reimagined from the ground up. Rather than being high-power, high-caliber defensive spells that are hard to use, they are now low-caliber, low-power spells that have one of two utility purposes: either reducing an enemy's movement speed temporarily, or reducing their ranged attack firing rate. These utility spells fill an interesting niche in terms of providing some new tactical combat options, while at the same time finally ditching those touch, punch, and fist spells that were almost universally disliked. Those were definitely the weakest link in the player arsenal, and nothing we had been able to figure out made them any better. Note of course that the whips and tridents are still alive and well, and still fulfill their same role that they already did. The other big melee-related change is that now the monsters that were resistant-to-all-but-melee-and-ammo-attacks are now instead resistant-to-ALL-attacks-if-a-player-is-not-standing-close-enough-to-the-monster-in-question. This makes them no longer class-specific or spell-specific, but means that whatever class you have chosen has to close the distance with these enemies and take them on up close. This keeps the general feel of the ocean shallows, for instance, intact; but at the same time removes all of the frustrating class penalties associated with it. Valley 2 Beta .806 "Balancing Well With Others" Released! This one has a lot of little stuff included in it, which add up to mainly polish and bugfixes. Chief among the bugfixes are a bunch of improvements and fixes to multiplayer, making MP a vastly cleaner experience than it was before. At the moment I'm not personally aware of any outstanding issues in MP (although I'm sure there are some I'm not aware of yet), and in my testing today things seemed to go really well in MP even with our pretty-bad-lag simulator on. There's a lot of graphical polish in this version: fifteen buildings, a number of monsters, etc. A lot of spell balance, too; including fixing up some spells like debris field that didn't work at all, and some spells like feather spray which didn't work conditionally. At the moment I'm not personally aware of any outstanding spells that flat-out don't work anymore. I think it's pretty well down to balance now. On the strategic side, we've really improved the feel of things with the interface actually telling you what will be purified if you go onto any given tile. What a difference that makes even to me when I'm playing it; I know all the purification rules very well, but even so I was not really factoring those in my mind when I'd make strategic moves. Now I can, trivially, because the interface tells me what I need to know very quickly. That's pretty cool. We've also made some shifts that stem from trying to balance Deep Gates without nerfing them so hard that they lose their fun factor. Going along with that comes some changes to how the scouting of auto-purified tiles work, and what triggers the deep gates, etc. I think this mechanic is now at least a lot closer to properly balanced. I didn't manage to get in any more sound effects work today or yesterday, unfortunately, but I hope to tomorrow. Yesterday for me was a lot of work on footage for our upcoming trailer, plus other miscellany. Today for me was miscellany plus lots of banging away at the multiplayer code. While Valley 2 makes its final preparations to transition from beta to 1.0 (launching February 18th), a lot of great coverage has poured in from both game blogs and video channels alike. We've all been busy chatting it up with various publications about everything that's kept us busy in the early part of the year, and some very nice AI War coverage surfaced in the past couple weeks as well. It may have seemed like a long wait, with the expansion launching a few months back, but that's actually pretty typical for any AI War release. The game just demands some investment to play properly, so we really appreciate these reviewers for taking the time to play and write about it. Some notable announcements coming up soon, including: release info for Shattered Haven, where we'll be traveling/demoing, and some other stuff the rest of the team would collectively strike me down for mentioning at this point. DealSpwn included the original A Valley Without Wind in its 2012 GOTY Awards Feature. Chris is featured on Game Wisdom's latest podcast, discussing both Valley titles and Shattered Haven. Pixel Perfect Gaming posted a preview of Valley 2, after taking a first look at the beta. Chris was also interviewed by Indie Games Channel on Valley 2. Examiner lists out its Five Reasons to Look Forward to Valley 2. IGN included Valley 2 in its 50 PC Exclusive Games in 2013 feature. Valley 2 Beta .805 "Warehouse District" Released! Valley 2 Beta .804 "The Angst Of A 360 In Search Of Its Control Node" Released! This one has a title that's a bit of an in-joke to some old AI War stuff. At any rate, it's primarily referencing that the gamepad defaults are now a lot better thanks to the tireless work of community contributor Pepisolo. What a big relief! There are also a number of more cleanup/clarity type of things on both the adventure side, helping to make things as balanced and interesting as possible. The late-game balance for the adventure side actually has seen a much more extreme change that should bring it more inline in difficulty with what people would expect. And farms have been nerfed pretty hard on the strategic side, helping to bring more balance to the food situation. There's a little bit of sound effect work in here, and I had planned on doing more, but frankly I'm out of energy for the day. It's been more than a month since I've had a day off, so I'm going to take a few hours off and come back recharged for tomorrow. The 1.0 release is only a week from tomorrow, so it's great to see this all coming together so well at this point! Valley 2 Beta .803 "Just Give It To Me Straight, Okay?" Released! This one is the second release for the day. I thought about calling it "HUD 2: The HUDDING," but decided against it. Suffice it to say, the thing I'm most excited about in this release are the massive improvements to the main GUI and various sub-menus in the interface. Here's a screenshot! Note that my character is level 16 and has basically all the perks for health turned on in order to get a life bar that big. So he's a bit of a health tank but not that strong in terms of his output. Also he's basically out of ammo, so the ammo donut has shrunk down out of sight in the bottom of the HUD; that icon is still there. Note that it now labels what the donut is, and also labels the ammo cost of the fourth spell slot, too, though. Really, though, the biggest thing in this release from a non-existing-player's standpoint are a whole plethora of improvements to help them get into the game easier. Some of these improvements also just make life easier for existing players -- it's nothing changing the core game itself, just more interface and documentation items, mainly. There's also now a new cheats window that you can open up with the L key when you have cheats mode on, and it lets you do a ton of cheaty stuff. More to the point, this is actually the bulk of our internal debugging menu, and some players wanted access to this stuff to help them with testing (which is why we have it in the first place for ourselves). Oh yeah! And there is now a low-pitched, non-annoying text scroll sound effect for dialogue like old-school games generally had, emphasizing the old-school roots the game has. I'm really grateful to Pepisolo for suggesting this, and I need to really remember to also put this into Shattered Haven as soon as I have a chance. It really adds a lot, I think. Valley 2 Beta .802 "It's Dangerous To Go. Read This" Released! This one is the first of what will be two releases today, because there was a critical bug in the prior version that was omitting region descriptions and thus making the game vastly harder. There are a variety of other bugfixes in this one, and then there's also a couple of new characters and a lot of character polish. The biggest change of all here is the displayed danger levels on regions now taking into account the base level of danger represented by each region type; so that should help new players gauge the actual relative danger of each area, though I'm not convinced that the numbers I've put in are perfectly representative yet. Valley 2 Beta .801 "Oh, Sorry About The Shrapnel In The Face, Jim" Released! This one is filled with... well, all sorts of stuff. We're getting into the territory where the changelogs are hard to sum up. It's a huge collection of small things, rather than a midsize collection of big things. Oh, by the way -- I don't think we've announced this yet, so I will take this chance to now. Valley 2 is going to be going to 1.0 on Monday the 18th. So we're really getting down there now! * Lots of sound effects work. The tier 1 mage classes are now finalized, and many of the other mage classes have large portions of final bits to them. Some more of the monsters now have that, too, but largely I've not started on the monsters yet. * A good dozen or so monsters have been rebalanced in various ways, based on our first monster balance thread. Another one (focused on this version and beyond) has now been created. I sense the start of a trend, like our "Worst Unit Of All Time" poll in the AI War subforums. * There's new strategic stuff, like the ability to skip the tutorial bits at the start, and the ability to undo moves of your NPCs if they didn't fight or do a few select other things. Also some balance shifts on the strategy side, and it now shows you the perk token counts on each region. * Oh, yeah -- the way buildings are handled in a lot of the more annoying regions is a lot better now. Now they shouldn't be "the more annoying regions" anymore. All in all the time to exploit a given region, and flip back and forth between the strategy and adventure parts of the game, should be better balanced now. There are still bits that take longer -- by design -- but they are also a lot more rare comparably speaking. 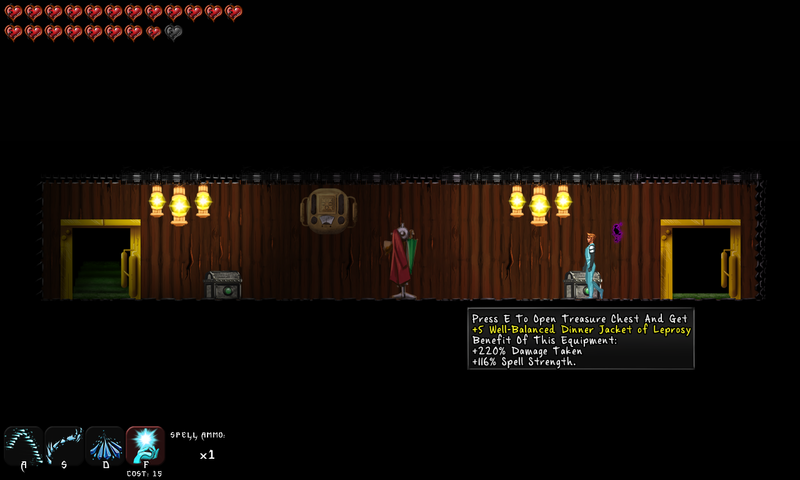 * Oh, also fixed a number of bugs with various spells in multiplayer and solo. One of which was causing you to friendly-fire YOURSELF when you used debris field spells. But it's all fair -- the firewalker monster was friendly-firing himself, too, the poor guy. ;) All that stuff is now fixed, along with the usage of explosions and rockets and so forth in tight corners and against walls. Big bunch of polish, in short. This is definitely a very satisfying part of the development cycle of any game or expansion, I have to say. More to come soon. Enjoy! Valley 2 Beta .800 "Soundscapes" Released! This one finally starts work on the sound effects for the game, as well as having numerous refinements for the adventure and strategic portions of the game. Lots of art updates in this one, too. The big thing on the strategic side this time is that there is now a better-defined early game period (as opposed to the middle and late game). Basically Demonaica comes out much later than before, but other monsters spawn in the meantime. This really changes the strategy of the start of the game so that it's less rush and more thoughtful. Anyway, the sound effect improvements are a big deal, and are about 40% done at this point. I think you'll agree once you hear them that the aural landscape is vastly improved now, and that it makes a huge difference to the feel of the game in general. I'm rather surprised by how much this improves things, honestly. Valley 2 Beta .728 "What A Horrible Night To Be In The Forest" Released! This one finally brings us up to the complete monster set: in the end, it turned out to be 125 monsters. A couple shy of the 127 I thought it might be yesterday, but considerably more than the 114 that we originally set out to create. And somewhere in the realm of 3x as many monsters as Valley 1. This has been a long road, but I think it was definitely worth it to get all the monsters in there the way that they are. Each biome really feels unique and requires different strategies with different mage classes, which is a really good thing. We couldn't have done that with fewer monsters. Plus the feeling of exploration is just much higher this way, too. Anyway, now that the monsters are complete, the game is essentially feature complete. What that means is that all the major mechanics are in place and working, and so now it's just a matter of bugfixes and polish, and more minor improvements. There's a lot of that still left to do, but we're expecting to go to 1.0 early next week -- so we're definitely in the final days here! Valley 2 Beta .727 "Mercenary Food" Released! This one is the second of what will actually be three releases today, turns out. There were a couple of exceptions that could be thrown when you attacked two specific enemies in this versions, so hence the extra release. This version includes a lot of improvements to the strategic game's handling of food, brings back mercenary coins with a new function, lets the windstorm generators blow your spells around in the wind again, and has a myriad of other bugfixes. Valley 2 Beta .726 "Hold Still, You!" Released! This one is the first of what will be two releases today. The main reason it is coming out now is that it fixes a couple of key balance and bug issues present in the prior version. But it also includes three new monsters, bringing the game's total up to 116. Valley 2 Beta .725 "Seaside Fistfight" Released! This one is a bunch of more polish and another fifteen monsters. The total is up to a whopping 113 monsters in the game at this point, but I still have 14 more to go. I had hoped to be done with all the monsters today, or at least down into the single digits, but I got sucked into some time-consuming polish and bugfixes that needed to go in. So the last of the monsters slides another day or slightly more. This is another cool release of them, but these were definitely harder-won on my part. I only got 9 done yesterday, and 6 today, versus 18 the day before yesterday. Still, that's just kind of how it goes when you get down to the last things and you're not willing to sacrifice quality to rush through it. I'm particularly proud of the newly-completed ocean shallows monster set in this release. A number of the monsters there are immune to all spells that aren't melee or ammo-based. This creates situations where you really get more of a Zelda II or classic-Castlevania vibe if you go for melee combat, or you get a very conserve-your-ammo Resident Evil vibe or a very avoid-detection-and-flee semi-stealth-game vibe, depending on how you tackle these. I'm also really pleased with how the feel of the grasslands and desert are evolving, and on how the lava flats dinosaurs have now been finished up. All of the regions of the game are really getting to have a very unique feel to them now, which is really what I wanted; you really can't mistake what region you are in in this game. Then the random combinations of monsters that you encounter in the level up towers and the overlord keep adds even MORE variety of unexpected tactical situations, which I also like. This was something I'd planned since first designing out the monsters for this game, but the effect of this decision is only really becoming heavily apparent now that the monster set is nearing completion. I'm quite pleased with it. The rest of this release is hugely eclectic. Lots of bugfixes, including some multiplayer ones. Tons and tons of slice fixes from Josh. Some balance improvements. Three new caliber-related perks instead of the featherweight perks. A bunch of awesome updated art from heavy cat once again. More monsters coming tomorrow -- as many as I can stuff in. Enjoy! Valley 2 Beta .724 "Keep Running When You See That Triceratops Mage" Released! This one is all about both monsters and multiplayer. And fixed slices. And nobody expects the Spanish Inqui... nevermind. This is a really good batch of monsters, I have to say. The feral chicken is just awesome, and the hopping locust is such a crazy different monster, too. I'm also a big fan of the hungry ghost. All in all 18 new monsters were added in this release, bringing the total up to 96 monsters in the game (not counting bosses). 4 out of the 12 biomes now have their full set of monsters (the others temporarily pull monsters from other biomes, as has always been the case so far with this game). It's interesting, because several of the biomes are complete, a few others are nearly complete, and a few others are really barely started. The desert, for one -- until tonight, it only had the Ceiling Asp out of its set of monsters. Now it has three out of its total roster of 9 uniques planned, but that's still not much to get a sense of what the desert will really feel like at all. Funny how these things work out. Keith was also working today, and hoo boy did he knock out some key bugs affecting multiplayer. He also managed to get rid of that lockup that could sometimes happen when you were first creating a new world. He got rid of so much stuff from the roster for next week, in fact, that's why I feel like I can take an extra half day or a day to finish off the monsters properly. Last I heard today, Josh had it down to about 900 errors being reported by the unit tester of slices, down from 1100 yesterday. He was also a real presence today, helping out with some buildings stuff as well as that. Long weekend for Arcen, for sure. There's a ton of polished art in this one, mainly in the variety of buildings in terms of what you will notice. And ohmygod does it look awesome. A lot of the most sketch-like buildings are now really superbly finalized. There's still many more that have to be updated to a minor or a major degree, but this was around a third of them all in one jump today, I think. 1. Drop equipment from the escape menu. 2. Build clinics on the sites of destroyed robotic towers and thawing towers. 3. Have a much better chance at actually completing the robotic research facilities without having to turn down the difficulty (do let us know how that feels now). Valley 2 Beta .723 "Clinical Study Of Laser Spiders" Released! There's a whole bunch of improvements to the physics and reliability of a number of the spells. Mostly the pattern sort of attacks, like crosses and crescents and circles. Also things with areas of effect like rockets. Boy does it feel better now! Formerly Skelebot Research Facilities, these have gotten a complete overhaul, monsters-wise. They now use a mix of both the abandoned town and future junkyard for monsters, leaving out some of the more specialized monsters (like the perimeter guards and C4 fliers) that really don't work well when you're trying to make a hasty retreat. These should be a ton more fun (and possible) now. Since pretty much the start of beta, there have been some tiles that didn't have a strategic purpose, and that kept shifting as we kept retiring mechanics and adding new ones. Now that all the core mechanics have settled down, all of the tiles have a purpose. Swamp Belltowers give you a useful new ability when you find them -- there are two on each map. 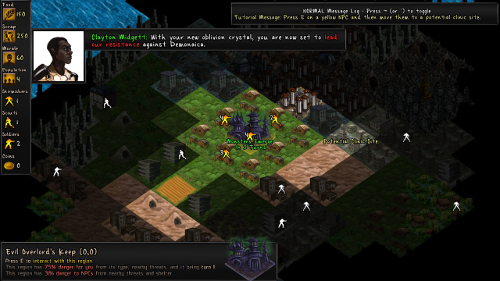 Abandoned Town Watchtowers can be constructed by you in order to slow the advancing troops. Junkyard Industrial Towers can be captured when you find them and work like excellent factories -- there are three on each map. On the monster side, we also have some new stuff. Gates From The Deep are new threats that you'll have to deal with as soon as you get close to them. There are six per map. And Stratospheric Citadels now get some special protection from Demonaica which may prove... surprising. A lot of stuff about the world map generation has been subtly improved, and in general the balance of these will now skew less based on the random number generator. But the shapes and general discovery still varies as much as before. I've finally implemented automated unit testing for slice design validity, and Josh has been using that to hone in on all the various problem slices and fix them. Things like ceiling clingers placed on the floor for some reason, and stationary fliers placed right up against a wall so that they remain tiny, etc. All in all Josh has put fixes in to 127 out of our 3015 current slices files in this release, and he reports that the unit tests are reporting 1100ish more issues that he's going to be looking at over the weekend. When a file has something off with it there are usually multiple things off, so that 1100 issues does not represent 1100 files; and the 127 files represents at least twice that in issues, most likely. Most of the issues that are there aren't really that severe, thankfully, but they do cause oddities like monsters walking in the air or appearing tiny against a wall or whatever, so it's stuff we're making sure to get cleaned up by 1.0. The total number of monsters in the game is now up to 78, and there are some more really good ones in this batch. Surveillance Cameras and the Laser Spiders they spawn are perhaps my new favorite enemy in the game. I still have another 44 monsters to go based on my current roster, though; I wound up adding 6 monsters to the spec over the course of this release, so the target currently stands at 122 rather than the previous 116 (or the original 114). Funny how that keeps happening, but I may wind up trimming a few monsters to get back closer to 114 as the time nears, we'll see. My intent is to get through the remainder of the monsters this weekend if it kills me; there's not going to be time to polish them all properly if I don't get that done, but I think that it is -- barely -- doable. I've just kept getting sidetracked with improving other things that also needed attention, so it's put me pretty behind on the monsters. It's all been for the better, but it just makes my schedule extra insane for a bit. As usual, there's a lot of other minor improvements in here, across the board. Definitely check out the release notes. Arcen Games cult classic, and ever-evolving space strategy title AI War: Fleet Command has been deeply discounted on Steam. For the next week the AI War Alien Bundle, a package that includes the base game along with AI War's first three expansions, is just $4.24/£2.99/4,24€. That's a ton of content, for a minuscule price. The same 75% off discount is offered to the bundle's individual products as well. That includes the Children of Neinzul micro-expansion, which has all of its profits funneled directly to Child's Play. A donation will be made regardless of whether the content is purchased by itself or as part of the Alien Bundle, so the contribution will be tallied either way. These offers end at 10 AM PST on Thursday, February 7th.